The American Revolution took place after Britain put in place the Intolerable Acts, in the American colonies. The Americans responded by forming the Continental Congress. The war would not have been able to progress as it did without the widespread ideological and material support, of both men and women. 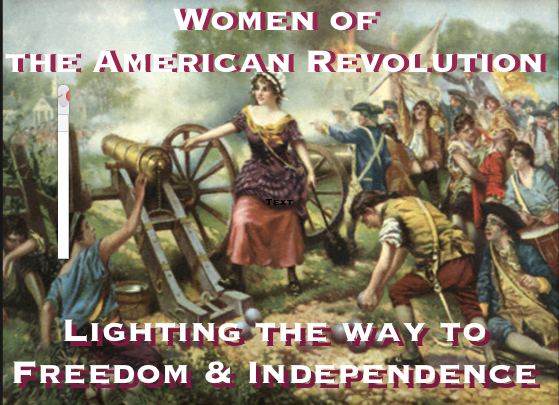 While formal politics did not include women; the action women took in support of the American Revolution were charged with political significance as they confronted the Revolution. Halting previously everyday activities, such as drinking British tea or ordering clothes from Britain, demonstrated Colonial opposition during the years leading up to and during the war. Women participated by boycotting British goods, producing goods for soldiers, spying on the British, and serving in the armed forces disguised as men. Prior to the signing of the Declaration of Independence, in a letter dated March 31, 1776, Abigail Adams wrote to her husband, John Adams, urging the Continental Congress not to forget about the nation’s women when fighting for America’s independence from Great Britain. Yet, despite this impassioned plea for all to be included women and slaves were left out of the US Constitution. The Equal Rights Amendment a US Constitutional Amendment will empower women. It will improve the lives of all women no matter their color. Without the ERA proposed legislation has not teeth. We need the ERA for all to be treated equal under the law, women’s rights must be made a priority if this nation is to continue to be a leader in human rights. When you vote in the upcoming presidential election, I ask that you look at the all presidential candidates and ask yourself do they represent all people? Is the Equal Rights Amendment on their campaign platform? How much longer must the ladies wait til they enjoy the same the rights, privileges and freedoms that men enjoy? When will all Americans be equal? Do as the women of the American Revolution did, show your support the Equal Rights Amendment by action, vote for the candidate patriotic enough to stand for all. Vote the Candidate with the ERA on their platform.